Paw Talk - Pet Forums > Rodents > Mouse & Rat Discussion > Rat addicted! How many rats do you have? I feel like I just can't turn any ratties away (I foster for my local Pet Rescue)! My home is now filled with more rats then I know what to do with, my friends and family think i'm crazy! How many rats do all of you have? Ahh, you have me beat for sure. My husband and I have two male rats, named Achilles and Maximus. We adopted them from a local rat rescue. They came from an "oops" litter and we adopted them when they were little babies. I've got the capability to keep up to 18 rats. The most I've had at one time are 9. Right now though, I have 3. I don't mean to spam but you guys seem to know a lot about mice so... could someone look at my page I think my mouse is Sick! Where is your page at? I was trying to find it but there was no link or anything? I am new so I cant post links but if you go to the mouse/rat page its one of the top pages. I have 13 all together.. 7 males and 6 females. 2 of the females were supposed to be my sister's, but I ended up with them. And I may be taking on 2 more as rescues unless someone else in the nj area can take them (I just posted about them in another post). 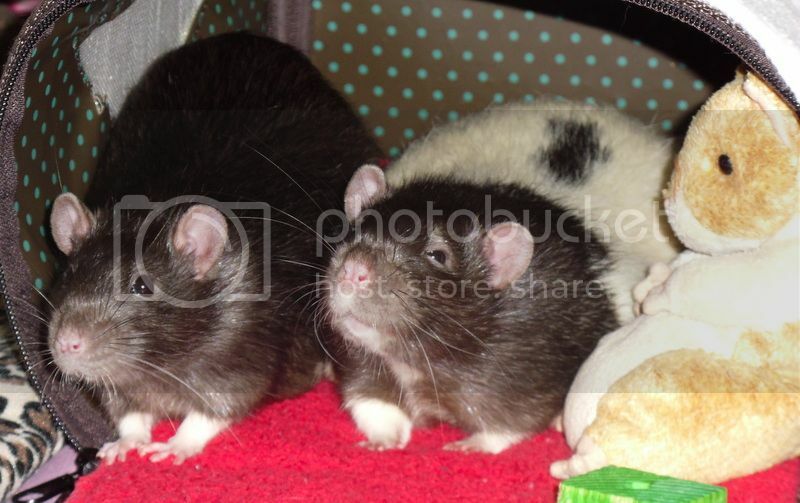 I have two rats, Pompeii (black and white) and Montgomery/Monty (tan and white). I have had 5 rats in my life and I only keep two at a time. I am still living at home, so because my living conditions could change on a dime, since I just graduated college, I am afraid to get a rat pack and then have to get rid of them or have difficulty paying for them/rehoming them if something comes up. Monty and Pompeii came in an abandoned litter of babies that were left at my workplace. They were just going to be used as rat food. I took them home when they were 5 weeks old and they were born May 2012. I have trouble enough watching them during play time, I could only imagine how hard it is watching a whole pack! Monty and Pompeii are just beautiful! What sweet boys! I loved the photo so much. I am on the same page with you. My husband and I have always had just two boy rats at a time, so that we know we will always be able to provide for them and have enough funds for vet visits, etc. And of course, having just two rats ensures they get spoiled rotten, as they deserve! But, I totally admire people that have the time and the money and the strength to take on lots of ratties who need homes. I have no idea how they do it! Thanks for sharing that photo, it was great! AND, I am sure Monty and Pompeii thank you every day for rescuing them from a horrible end as snake food. We got our current two boys, Achilles and Maximus, from a rat rescue when they were babies that were brought in as part of an "oops" litter. Your boys are just dolls, and I love their names! Last edited by Vladina; 07-23-2013 at 10:31 PM. Sometimes I really just want another rat or two, but I just am too afraid of moving and not being able to take them, or those vet bills. I went abroad for a month to Japan and had to have my parents watch them and I just felt way too bad leaving them there without me for that long. Plus, I had to take one to the vet right before I left because he had a bump on his leg, and I was afraid it could have been the beginnings of a tumor. Turns out it was nothing, and it was 60$. The one part about these babies is that the vet always gets me! I'm sure they are thankfully, although the spoiled brats don't show it very often! Always begging me for pieces of apple or broccoli and then viciously ripping them from my hands. Aww, thanks Juno! Yes, my husband and I also hate the idea of having to go somewhere overnight or travel or anything that leaves our babies in the hands of anyone other than ourselves. We worry ourselves sick when that happens so we very rarely ever go anywhere. So I know what you mean! I pasted a couple of quick photos here for you of our two boys. 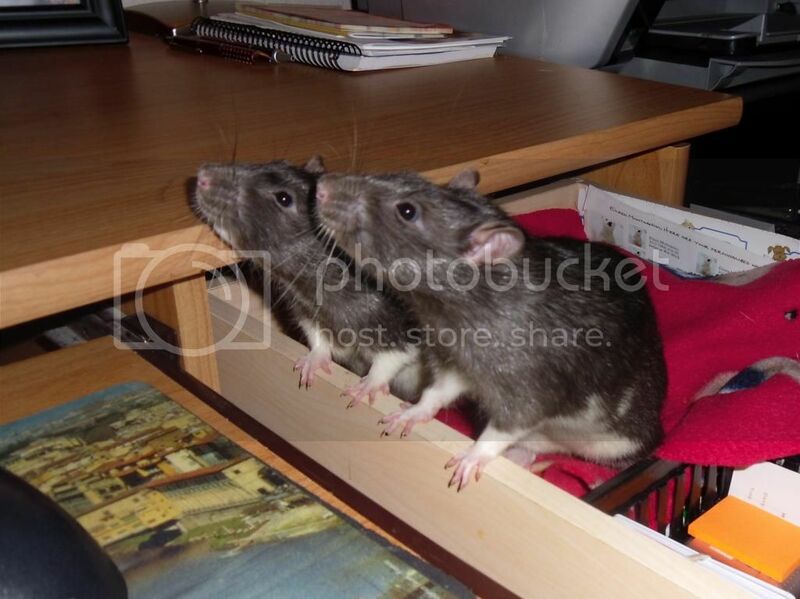 The first one, below, is the two of them posing in my computer desk drawer where they love to play sometimes, as it is right next to Mommy. It is very hard to tell them apart in this photo as Achilles, our black and white hooded boy, is on the left and his white body is hidden by Maximus, on the right. Maxie is a black berkshire rat, so he is all one dark color except for his forearms and his tummy, which are a creamy white. This photo, below, is a better shot of both of them. Achilles, our very fat squishy love bug, is on the right. He just loves to be loved! Maximus is on the left. He is our more skittish and nervous boy who always seems to have a slightly concerned look on his face. What a silly baby! He has never had a thing to be skittish or nervous about, but that is how he is, despite thousands of daily rubs, cuddles and kisses. I guess he was just born that way! They are both just sweet boys and we love them as our children. Since we have no human children, we put all our parental instincts into them! Oh my gosh, these pics are so cute!! Awww, thanks so much Lady Bug, I am glad you like them!! I have 7 rats. 3 rescues and 4 intentional buys. My newest rescue I got today her name is Mistic she was going to be a feeder at the pet store. She's pregnant. Any advice on what she needs more of less of or just of in general anything to make this first time momma to be a little more comfortable. You have a cute family!